Swimming builds powerful, flexible shoulders. When the human body moves through water it encounters "consistent resistance" across the complete range of motion performed. Swimming has only one resistance level and yet the application of additional repetitions transforms it from an easy beginner's workout into one rigorous enough to challenge the most elite athlete. The patented HeartFlex resistance assembly, like swimming, creates the same "consistent resistance" across the complete range of motion performed, producing identical results - without the water. Shoulder muscles built in this way have rock hard power, explosive speed, and incredible endurance because of their superior composition and structure. By changing HeartFlex positioning and its movements ALL individual shoulder muscles can be isolated and targeted for exercise workouts, stretches, and therapy. Heart Flex allows "patient controlled active therapy using passive resistance" for maximum joint manipulation through a range of motion (ROM). Consistent resistance through the range of motion performed strengthens the entire muscle dynamic. Heart Flex creates only "consistent" passive resistance to lessen the chance of "overloading" and reinjuring healing structures during shoulder rehab. 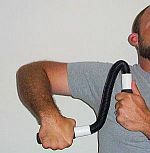 Athletic Trainers (AT), Occupational Therapists (OT), and Physical Therapists (PT) utilize the Heart Flex to target and prescribe individualized shoulder rehab exercises. 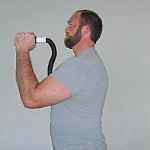 Heart Flex shoulder exerciser movements work both sets of muscles (flexors and extensors) against each other cutting workout times in half. Because Heart Flex develops opposing sets of shoulder muscles concurrently and symmetrically their strength is balanced. Muscles have been compared to taffy. If you stretch taffy when it is cold it breaks and tears, after being warmed up it will bend and stretch without structural damage. Use the HeartFlex shoulder exercise machine before strenuous exertion to stretch upper body muscles to their optimum length. Its simple and silent operation is ideal for pre-exertion warm ups, keeping shoulder muscles limber during activity pauses, and for post exertion cool downs. 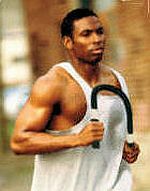 HeartFlex shoulder workout equipment performs cool downs after rigorous training sessions or sporting events. It allows the athlete to slowly decrease activity and eliminate accumulated muscle toxins while incrementally re-establishing pre-exercise physiology. 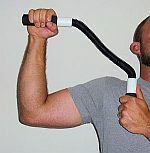 Heart Flex is lightweight (weighs about one half pound) and compact (24" long). 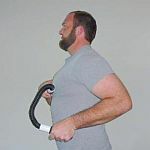 It is easily transportable for use at home, at the office, on the bus, in the locker room, on the bench, in the dugout, in the training room, on vacation; anywhere that shoulder workouts and shoulder rehab exercises are essential. 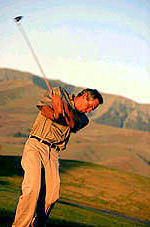 1) Stand with feet shoulder width apart and a straight back. Hold the HeartFlex behind your back with your palms facing up towards the rear and your thumbs pointing in. 2) Raise your arms as high as you can behind you without pain. Hold the stretch for fifteen (15) seconds. Relax and then repeat the stretching procedure through ten (10) repetitions. This static stretch improves shoulder mobility thus lessening the stress on the shoulder rotator cuff muscles during physical performance. 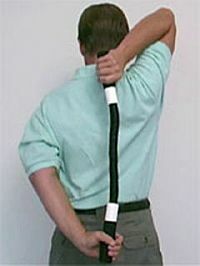 1) Hold the HeartFlex behind your back with one hand above your shoulder (palm facing forward) and your other hand behind your back, below your shoulder, about waist high (palm facing backward). Keep the HeartFlex straight up and down and aligned with your spine. 2) Gently and slowly pull down your upper hand with your lower hand as far as you can without pain until a stretch is felt in the upper shoulder. Hold the stretch for fifteen (15) seconds. Relax and then repeat stretching procedure through ten (10) repetitions. 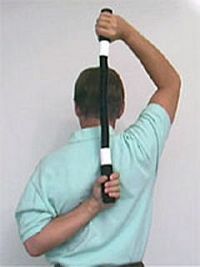 This exercise stretches the rotator cuff of the shoulder of your upper arm. 3) Gently and slowly pull up your lower hand with your upper hand as far as you can without pain until a stretch is felt in the lower shoulder. Hold the stretch for fifteen (15) seconds. Relax and then repeat stretching procedure through ten (10) repetitions. 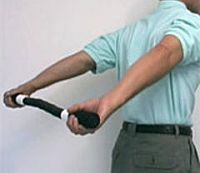 This exercise stretches the rotator cuff of the shoulder of your lower hand. 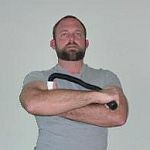 4) Reverse hand positions and repeat stretch protocols 2) and 3) to stretch the shoulder cuffs of your other hand. These static stretches improve shoulder mobility thus lessening the stress on the shoulder rotator cuff muscles during physical performance. 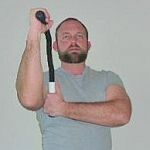 Improves ALL activities that benefit from increased shoulder strength - baseball, golf, basketball, volleyball, motorcycle riding, jet skiing, wakeboarding, fishing...you name it! Still not convinced; want more information before you buy? Read our testimonials. Money back guarantee and free priority shipping.